Let eTrack be your CRM (customer relationship management) for all contacts including staff, clients, consultants, contractors, suppliers. eTrack is designed to be always available and synchronised with other applictaions and devices so provides a single source of truth for everyone to access. 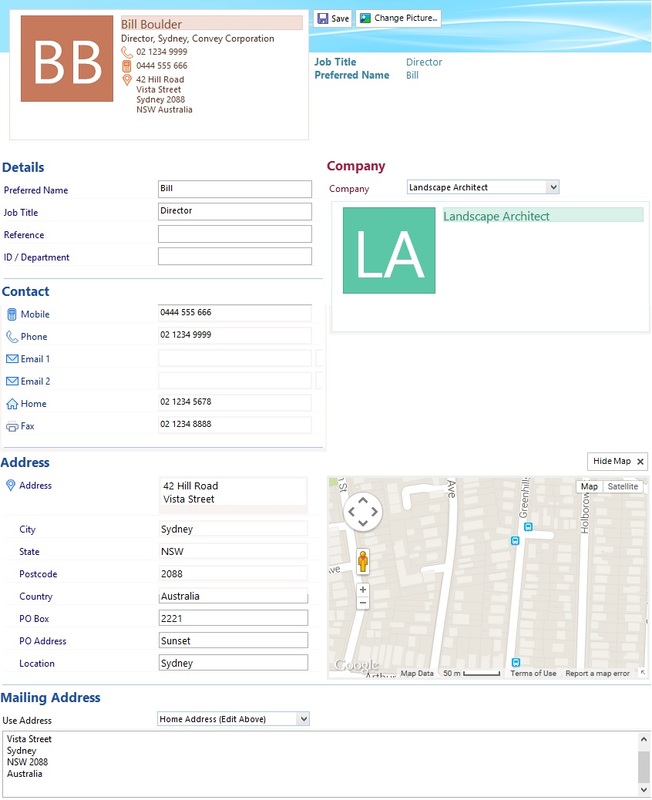 Share contact details across your company so always uptodate. Have a portal to everything to do with a client: contact details, projects, correspondence, relationships, budgets, revenue, profitability, documentation. Synchronize with other devices and applictaions such as Microsoft Outlook. Use for mail merges and statistical reporting. 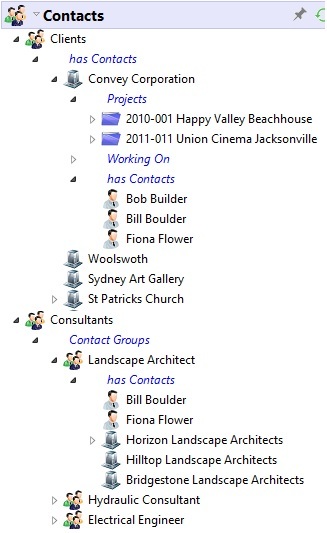 To the right is one example of a contact hierarchy that is fully configurable, and below shows the details for a typical contact. Notes such as correspondence, progress, issues or actions can be added to Contacts, Projects and any other entity at the click of a button. The logged in user and date/time are automatically inserted. A scrolling chronological history of all entries can be viewed at once without having to click on each entry to read. Documents such as contracts, certificates, pro formas and letters may be created from eTrack templates or linked. 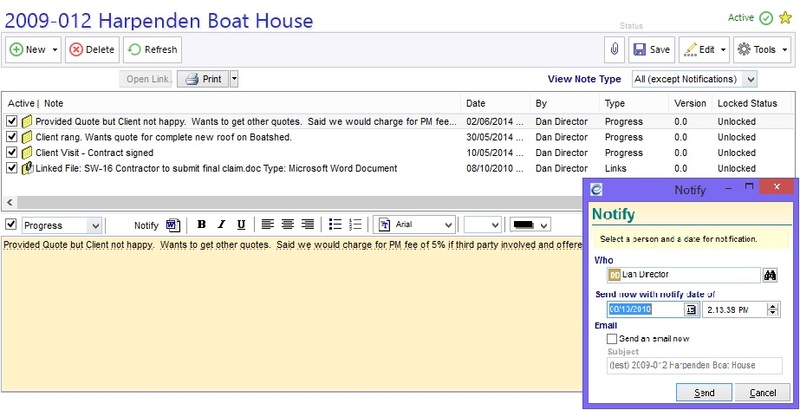 eTrack includes a Document Management module and a built in document word editor. For other types of documents the appropriate program is automatically launched when selected. Maintain a running history of notes such as correspondence, actions, progress and issues. Send entries by email to staff and contacts or have them pop up when another user logs on. Embed or attach documents with with Microsoft Word style editing. Automatically view action notes when you log on. Hyperlink to other Document Management Systems such as TRIM or CHRIS.